Martyn Dolby faces a busy day at the Northants county finals. 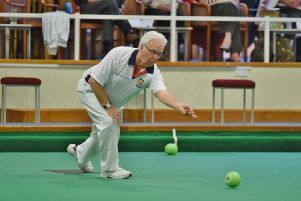 Stamford bowlers Martyn Dolby and Chris Ford will be spending most of this Sunday on the green at the Peterborough & District Club competing in the Northants Bowling Federation indoor finals for men and women which get under way at 10am. Dolby is expected to be in action in excess of 10 hours having qualified for what is believed to be a county record five finals, while Ford will be playing in four of the five sessions, two of them in the company of Dolby – mixed pairs and mixed triples. Such has been the success of Stamford bowlers this season that no fewer than seven of the 11 finals will be contested by players from that club. Just three titles are being defended – Jenny Harvey and Carol Hunter in the women’s pairs; Martyn Dolby in the men’s veterans singles and Nick Wilkie in the men’s pairs, this time with Joe Randall. The winners will represent the county in next month’s national finals at Newark. Women’s singles: Chris Ford v Joan Robinson. Men’s veterans singles: Peter Edwards v Martyn Dolby. Mixed pairs: Moira & John Holroyd v Chris Ford & Martyn Dolby. Women’s pairs: Fiona Richardson & Julie Masters v Jenny Harvey & Carol Hunter. Men’s pairs: Nick Wilkie & Joe Randall v Adam Warrington & Martyn Dolby. Under 25 singles: Stephen Harris v Josh Clark. Women’s senior singles: Shirley Suffling v Joan Robinson. Men’s singles: Doug Want v Derek King. Mixed triples: Chris Ford, Adam Warrington, Martyn Dolby v Fiona Richardson, Neil Wright, Simon Law. Men’s triples: Adam Warrington, Martyn Dolby, Jonathan Earl v Stephen Harris, Cliff Watson, Peter Edwards. Women’s triples: Moira Holroyd, Margaret Bloxham, Joan Robinson v Chris Ford, Shirley Suffling, Jan Want. MEN’S PAIRS: Adam Warrington & Martyn Dolby bt Howard Shipp & Neil Wright 15-11. MEN’S VETERANS SINGLES: Martyn Dolby bt Mick Linnell 21-15. WOMEN’S SINGLES: Joan Robinson bt Julie Masters 21-14; Chris Ford bt Fiona Richardson 21-15. The Northants Bowling Federation ended their Derbyshire Trophy inter-county indoor championship campaign in dramatic fashion by scoring four shots on the last end to defeat Norfolk 98-95 at Acle. However, having lost to Lincolnshire earlier in the season, the victory was not enough to secure them a place in the national finals at Newark next month, but it did put a massive dent in Norfolk’s hopes of winning the southern section. Tristan Morton took a chunk out of a jack with one of his firing shots during his rink’s 31-11 victory, while team captain James Harford held on for a four-shot win at 31-27. Howard Shipp, Paul Dalliday, James Harford won 31-27. Brian Martin, Bob Warters, Tristan Morton won 31-11. Stephen Harris, Neil Wright, Jonathan Earl lost 20-25. John Holroyd, Nick Wilkie, Joe Randall lost 16-28. City bowler Nick Wilkie narrowly missed out on a place in the final stages of the national indoor singles. He was beaten 20-21 by defending champion and current Scottish International Open winner Greg Harlow in the area final after letting slip a 20-16 lead. Wilkie had beaten newly-crowned world indoor champion and world number one Nicky Brett in an earlier round. The Peterborough senior men’s team went nine points clear at the top of the Cambs League following their 73-63 victory over Huntingdon A that netted them eight crucial points. With a number of absentees, team captain Rod Maplethorpe was forced to reshuffle his team, but they rose to the occasion to keep Peterborough in the title hunt. Closest rivals St Neots A and Cambridge Chesterton A both have two matches in hand worth twenty points, but Peterborough, who have three matches remaining, have to play the former away in their penultimate fixture, so there is still everything to play for. Mick Fuller, Terry Corney, Phil Afford, Frank Paul won 19-12. Les Sharp, Richard Day, Don Sutton, Joe Martin won 20-14. Norman Gray, Jeff Clipston, Mick Greaves, Ean Eagle won 18-15. Dave Smith, Pete Harvey, Richard Harrison, Rod Maplethorpe lost 16-22.